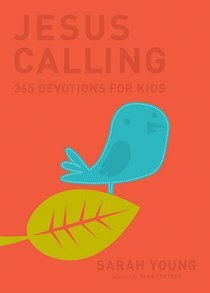 This collection of 365 daily devotions will speak directly to your child's heart. It encourages children to talk to Jesus and listen to his voice. Ages 8-12. About "Jesus Calling: 365 Devotions For Kids (Deluxe Edition)"
Based on Sarah Young's renowned bestseller Jesus Calling, this is a wonderful devotional for children. The scripture and themes correspond with the daily reading in the adult version, so parents and kids can share spiritual time together. This deluxe version features a rich blue and orange leathersoft hardcover with the iconic bird in center stage. It's a beautiful package that parents and grandparents will be proud to give children year-round. It is Sarah's fervent prayer that our Savior may bless readers, and now young readers, with His presence and His peace in ever-deeper measure. Sarah Young is quietly leading millions on a journey of intimacy with Christ. She has a philosophy degree from Wellesley College, a counseling degree from Georgia State University, a master's degree from Tufts University, and has studied with Francis Schaeffer's L'Abri Fellowship. She has been featured in the New York Times, Wall Street Journal, USA Today, and Christianity Today and has sold over 10 million books worldwide. Jesus Today received the 2013 ECPA Christian Book of the Year award. Sarah and her husband lived overseas for decades, counseling and planting churches in Japan and Australia. They currently live in the US.